This morning’s New York trading action started off on the downside once again for the metals. Gold practically erased yesterday’s gains and dipped to near the $1,640 (about 2.5% under the 200 DMA) per ounce while silver also retreated from last night’s closing values and dropped to near $32.20 an ounce. This morning, gold reacted not as much to the small-to-nonexistent initial gains in the US dollar but decidedly so to the news of possible further Indian import restrictions on bullion. More on that significant topic will follow below. Dow futures appeared to be inching higher following yesterday’s better-than-expected jobless claims data and as investors awaited US inflation numbers, industrial production, and consumer sentiment. The numbers on inflation were in line with expectations among polled economists and were largely driven higher by black gold prices. Food prices went down. BTW, such economists’ ‘expectations’ are factoring in a US inflation level of… 2.4% for the next decade; not quite Zimbabwe just yet, it would appear. On the technical side for gold and silver, we note one Daily FX.com technical analysis that spoke of the formation of a bearish "Dark Cloud Cover" candlestick pattern underneath the previous price support that has now morphed into overhead resistance, at near the $1,720 level. The Wednesday evening short-term Elliott Wave market update missive noted that gold prices had essentially not made upside progress over the past 7.5 months and that the Wednesday session closing at the $1,642 mark was beneath the closing achieved by gold on August 2nd of last year. Wednesday’s price washout in gold was followed by a modicum of bargain hunting yesterday but it was a move largely bolstered by a bit of a slip in the US dollar and a relatively firm crude oil market. Other than that, the speculative crowd was busy studying the damaged technical charts, fielding margin calls, and gauging the sentiment among investors. The latter was judged by one New York professional trader as "ruined" in terms of the hopes for any type of quantitative easing to come in the foreseeable future. The dip beneath the 200 DMA near $1,680 placed gold in what economist Dennis Gartman termed as "dangerous territory." One set of less-than-often — in fact, rarely- quoted reasons for gold prices to potentially work their way lower comes from Wednesday’s analysis by Seeking Alpha contributor Ananthan Thangavel, the Managing Director of Lakshmi Capital and author of The Commodity Analyst. Mr. Thangavel is noted for having called the precise top in the silver market last year and for having forecast gold’s slide in September as well. While he too focuses on the fact that the Fed has been "standing pat" since the end of QE2 and that such inaction (along with US dollar vigor) is contributing to waning enthusiasm in gold and other commodities, Mr. Thangaval delves deeper into the situation and uncovers some surprising (to some) facts in the process. To wit, while the majority of players in the commodities’ space have benefited from the expansion of the Fed’s balance sheet (QE1 +QE2) their continuing expectations for more of the same are flying in the face of a reality in which, by now, not only is there no further likelihood of that balance sheet swelling much further (or in a non-inflation-sanitized manner), but also one in which the huge inflation that was expected as an outcome of QEs I and II has not materialized. Aside from that, the US treasury market may be telling us something quite "meaningful" at this juncture and it applies to gold and even more so to silver. The signs in the US bond market also point to expectations of a stronger economy of late. So, anyway, many will ask: How can you get low inflation in the aftermath of serious monetary supply injections? The answer is pretty simple, really; just have the velocity of money wind down instead of in the opposite direction. That is precisely what has been going on in the US, as the money that the Fed has pumped into the economy has largely not moved through the economy at a clip large enough to engender the type of inflation that the gold bugs have been betting on (heavily so since 2008). The Fed’s cheap dough — for the most part-has been sitting pretty on US bank balance sheets. Mr. Thangaval also brings to our attention the shifting pubic attitude towards debt and the monetization thereof via inflation: a resounding "No!" is what it sounds like. We’ve heard it from the GOP, we’ve heard it from the Tea Party, and we’re hearing it from the Obama White House as well. Cutting spending where possible, raising taxes where applicable, and trimming deficits before they become lethal, these are all ‘in vogue’ attitudes in America lately and without party lines coming into the equation. It should be an interesting year-end, to be sure. 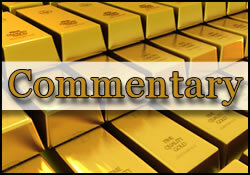 Finally, Mr. Thangaval opines that "emerging markets are much less able to buy gold than they once were. Consider for a moment that the average per capita income in China in 2010 was… $2,425. While India and China have valued gold as an investment for years as a cultural bias, the per capita incomes in these countries can simply no longer support robust gold purchases, especially if their currencies are outperformed by the U.S. dollar. This phenomenon was witnessed in India when gold purchases actually fell in Q4 2011 despite gold prices also having fallen during the period. The fall in demand was a result of high prices, accentuated by the rupee’s fall against the U.S. dollar. Conclusion? "While many gold investors would like to believe that emerging markets can keep prices rising indefinitely, they would be much better served by realizing that U.S. hedge funds and investors are ones necessary for them to see positive returns." Author’s note: The aforementioned hedge funds-according to the CFTC-have now slashed their gold-bullish bets by the most since about August of 2008. Mom and pops however have not yet joined the exodus. In this context it is further worth noting that after having just recently hiked import tariffs on gold and silver by a substantial amount, according to sources at UBS AG, India, the world’s biggest buyer, may [once again] be considering higher gold import taxes because of budget deficits. Actually, the problem that gold represents to India’s ballooning current account deficits is hard to ignore, despite recent ‘damage-control’ propaganda that asserts that much of the imported bullion ends up being exported in finished form. In a country that imports some $58 billion in gold (estimated to be the total in 2012) it comes as no surprise that "even the recent Prime Minister’s Economic Advisory Council had blamed the sharp rise in gold prices for the current account deficit and stressed the need to limit its appetite in India." There is talk of another 6-7% increase in the price of jewellery items in that country if (or, rather, when) new duties and excise surcharges come into existence. The Economic Survey for 2011-2013 has concluded that, as far as India goes, "A trade deficit of more than eight per cent of GDP and CAD of more than three per cent is a sign of growing imbalance in the country’s balance of payments. There is scope therefore to discourage unproductive imports like gold and consumer goods to restore balance." It appears that the "love gold" trade is not exactly that, when it comes to the attitudes of India’s economic stewards. Perhaps quite the opposite. Something to keep in mind as we go forward. Indian offtake has been a widely reliable and quite significant contributor to the rise in gold prices in recent years. While on the topic of Asia, let’s take a quick look at the latest developments in China. With one year left in office, Premier Wen Jiabao told reporters in a lengthy press conference this week that his country must adopt the idea of political reform and succeed at it, lest China is prepared to possibly "losing what we’ve achieved." Those comments were squarely aimed at Communist Party factions that do not share his views on reform and openness in Chinese society. Mr. Wen is also known for not wanting to loosen controls on soaring property prices, and for closer trade and investment ties with the USA. On the other hand, Mr. Wen’s valuable advice might be coming perhaps a bit too late to avert that which JP Morgan Chase & Co. has now called a "hard landing in progress" in China’s economy. JP Morgan’s chief Asian and emerging market strategist, Adrian Mowat, stated that "If you look at the Chinese data, you should stop debating about a hard landing. China is in a hard landing. Car sales are down, cement production is down, steel production is down, and construction stocks are down. It’s not a debate anymore, it’s a fact." Like Mr. Thangaval above, Mr. Mowat does have some CV credentials and professional achievement weight to add to his observations. He was the runner-up in Asian equity strategy for 2011 according to Institutional Investor. At this point, much as is the case in the gold market, the camps that assert a hard landing in China versus the ones which continue to see China as sailing right along and remaining an insatiable consumer of commodities are becoming more sharply divided and dug-in, with each passing day.